Delivery from £6.00 to United Kingdom in 5 - 9 working days. Our Print collection reinterprets the geometry and pattern that inspires our textured collections into a range of striking and uniquely designed original prints. The overall look is contemporary. It’s our take on retro styling, what we like to call "Retro meets Metro". 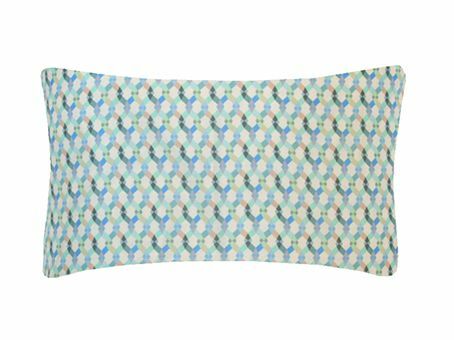 This cushion is printed on 100% silk and beautifully complements our signature textured cushions. Mix and match to create a feast of colour and texture. Specialist dry clean only. Due to handcrafted nature of the product, certain colour and design variations may occur which should be considered as the evidence of genuine craftsmanship. Founded in East London, hub of young creativity, Nitin Goyal London has fast established its trademark with its unique & signature look of visually and texturally crafted tactile fabrics and modern prints for the design led interior market. Quality is key and therefore every piece is handcrafted from start to finish making it even more unique.